Michael Bay's Transformers 4 continues to take shape, and even though we've heard rumor about some possibly epic story and character changes, when it comes to the issue of the human casting and character details, there's plenty about TF4 that inevitably feels like more of the same (for better... or worse). Case in point: today we have a double dose of casting news: one human, and two robots. And it all reads as being very familiar. Read on for the details. THR reports that comedian/actor T.J. Miller (She's Out of Your League) has been cast in Transformers 4 as the best friend and fellow mechanic to Flynn Vincent, the character played by Mark Wahlberg. Bates Motel star Nicola Peltz will play will play Vincent's daughter, while actor Jack Reynor will be getting his big break playing an unnamed racer-type guy who becomes Peltz' love interest. While Miller is a pretty funny guy in his own right (see: his hilarious bit as a smarmy Green Lantern ragging on Hawkman), but looking at the structure of this Transformers 4 human cast, the film is feeling less like the fresh start Bay has been promising, and more like a rejiggering of principle human characters in the original film. The young lovers, the tough guy, the comedic relief guy - even Kelsey Grammer as a shady government spook - sounds all too familiar to the characters played by Shia LaBeouf, Megan Fox, Josh Duhamel (or Tyrese), John Turturro and Jon Voight (respectively) in TF1. In short: Bay detractors probably have more of the same to look forward to - as do those who have loved the franchise thus far. The leader of the Autobots has a brand-new, beefier look thanks to a completely upgraded, custom-built Optimus Prime from Western Star (a subsidiary of Daimler Trucks North America). Another proud tradition of Bay's Transformers franchise is taking iconic characters from the TF mythos and adapting them as hot commercial automobiles who transform into generic robots that get small slices of screen time and almost no development. Now, we're not saying that's the case in this case; however, as evidenced by the photos below (and some accompanying information) a continuance of that tradition seems likely. Clearly Bay is continuing to "borrow" the names of iconic transformers; Slingshot doesn't even appear to have the same vehicle mode, as his G1 form was a plane, not a car. Not a surprise, though: most of the second-tier (read: totally forgettable) transformers in all three prior films have included "bastardized" adaptations that pay homage to the classic series in name only. However, the big thing to note is that while his vehicle form is clearly different, if that Bugatti is Drift, the character's inclusion correlates to an earlier rumor (also by way of JoBlo) about a new robot character who is a 'disgraced samurai Decepticon who seeks to regain his honor by helping the Autobots.' 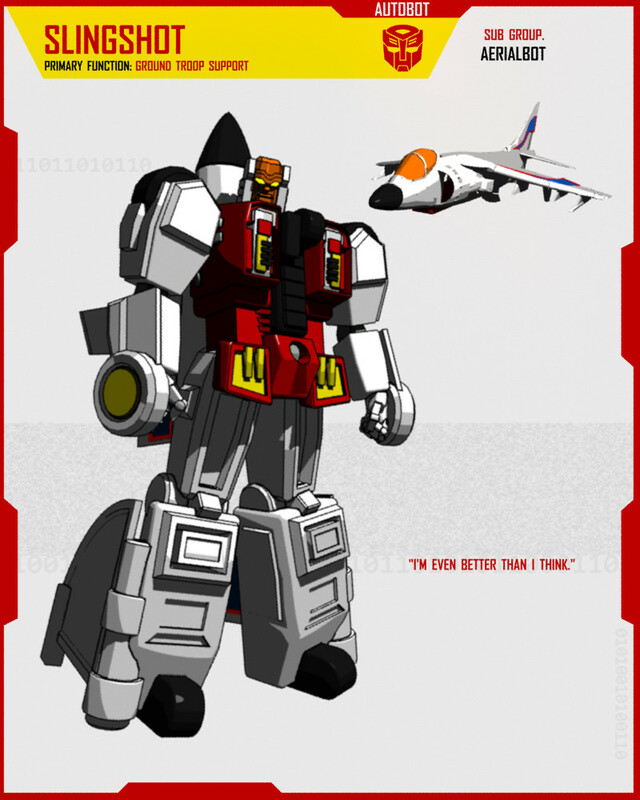 This happens to the exact bio for G1 Drift, who was once the Decepticon "Deadlock" until he traded his Autobot-killing guns for a set of swords, and sought to regain his honor by fighting for the good guys.